As Good Food Month draws to a close for 2007, I decided to venture out with Vicky for one more Let’s Do Lunch - this time it was Bécasse. Ever heard of “saving the best till last”? It was wonderful! I tried to book two weeks ago and was told they were fully booked up for the remainder of the month, but Georgia North (co-owner, restaurant manager and spouse de chef) told me to try on the day we wanted to dine since people booked well in advance and then cancelled. It was good advice and this morning they squeezed us in for 1:15pm. Upon arrival we were escorted upstairs, through a very full restaurant, where most of the other diners seemed to be eating the Let’s Do Lunch special too. Service was friendly, professional and prompt. 10 out of 10. Georgia North was decidedly thinner than last time I visited (when she was very pregnant and still managing the floor) and two of the same waitresses were still there! They must be good employers for staff to stick around in such a fickle industry. First we were treated with a very yummy amuse bouche. The base was like a parmigiano shortbread but I can’t, for the life of me, remember what else was in it! It was very pretty, extremely tasty and provided excellent brand exposure. Although they offered a special entrée to match the Let’s Do Lunch main, we went straight to the “slow roast rump of rose veal with crushed potatoes and a warm vinaigrette of spring vegetables”. The veal was luscious and pink, just as the name promised. It was served cut into thin slices that just tore with pressure from a fork. The vegetables were perfectly cooked, soft but still toothsome and they were dressed in warm juices from the veal. A mash of potato, olive oil, lemon juice and (perhaps) parsley made the perfect accompaniment. The meal was so flavoursome and yet afterwards we feel refreshed. The main was served with a glass of Brown Brother’s Barbera. I’m almost embarrassed to admit that I liked the wine. It was very sweet, not unusual for Brown although it’s softness was a good match for the veal. Vicky and I decided to order some dessert but before this arrived we were served a palate cleanser of vanilla and cardamom pannacotta with blood orange granita. The granita was sweet yet didn’t take on the blandness I associated with alkaline blood oranges. Tiny pieces of fresh blood orange added textural contrast before we scooped up spoons of creamy, decadent pannacotta. I couldn’t taste the cardamom or vanilla overly, but the combination with the granita reminded me of a red Splice, an ice cream I ate as a kid. For dessert, we couldn’t go past the musk stick soufflé with yoghurt ice cream and cantaloupe coulis. This was the best soufflé I’ve had in years. It was light and tasted nothing like egg, both qualities I have been unable to find in other recent soufflés. The potentially overpowering flavour of musk was fragrant and gentle, with flecks of nuclear-pink candy peaking through the fluffy soufflé. The yoghurt ice cream was perfectly sour to counter balance the sweet musk and fruity rockmelon sauce. The flavour combinations reminded me of Frutti della Luna, a unique gelato flavour I would order almost every day when I lived in Rome. Oh the memories! I was very pleased that Bécasse could accommodate us: we were the last lunch table to leave the restaurant as we tried to delay the deliciousness as long as possible . . . I was very happy when I discovered this yummy Syrian breakfast. I first spotted this dish on the menu of a Lakemba Lebanese restaurant, and it is indeed a dish eaten all over the Levant. My version is an amalgamation of many web recipes, mostly Syrian, that I read over before coming up with my Sunday morning brekkie. One of the grocery stores across the street stocks a lot of Middle Eastern goods, I suspect the owners are Lebanese, and so it was easy to find what I wanted when I snuck out of the house this morning. It’s such a gentle, moreish meal, perfect for a late morning or brunch hunger buster. You could even eat it alongside your eggs. 1. Drain chickpeas and rinse well. Place in a pan with cold water then bring to the boil. 2. Add a little salt then boil for approximately 7 minutes or until chickpeas are tender. Reserve some of the cooking liquor. 3. Heat a frying pan and (without oil) toast pita bread until browned, dry and crispy. Break into shards. 4. In a bowl, whisk yoghurt, tahini, garlic, ½ teaspoon salt and lemon juice until combined. It should have the consistency of runny paint. Add chickpea cooking water if it needs to be thinned. 5. Place pita shards in a serving dish. Cover with warm chickpeas. Pour over yoghurt sauce then decorate with drizzled olive oil, pine nuts, parsley and sumac/cayenne. Variation: you could also add minced lamb, cooked with a little lemon juice and mixed with fresh, chopped parsley and coriander. Finished off with fragrant, fresh parsley: this is my contribution to Weekend Herb Blogging, hosted by Estonia's Pille from Nami Nami. As part of Good Food Month, today I spent a few hours at Surry Hill’s Hudson Meats where I watched a very skilled butcher carve up a lamb into it’s various parts. Cowra lamb is the most common lamb in Australian supermarkets. It’s usually a Merino hybrid and is quick to grow but usually a bit tougher and has a stronger odour. The lamb that we worked with today was a Suffolk breed. These sheep are squat, large framed sheep with black heads and legs. They generally take longer to fatten up than Merino hybrid breeds and their carcases are quite meaty, with fine grain, lean flesh. They have a very high proportion of lean meat to fat. Records show the first Suffolks were brought to Australia in the very early 1800s, however the first officially registered flock was imported in 1903. These specific Suffolk lambs that we worked on had switched from milk to grass for a day or two before they were slaughtered so their meat was pale and soft. They were about 5 months old and weighed around 15kg. The farmer, who delivers a few of these special sheep every six months, sent them to the abattoir at Oberon and then forwarded them directly to Hudson’s Meats where the carcases are hung for three days to firm up before their debut on the chopping board. I wanted to give you a step by step account of the deconstruction of this unfortunate creature, but I didn’t take notes and the information was so intense and overwhelming that I can’t recall everything in detail. Sorry! It was interesting to reconfirm things I knew by intuition, such as meat is best stored uncut and it’s the oxidisation on the increased surface area that causes the lamb to start smelling. Also, serrated blades cause damage too so butchers try to cut the flesh and use their electric band saw only to slice through the bones. What was amazing was how the butcher would slice up this thing that looked like an animal and after a few cuts a familiar cut of meat appeared, like a flesh sculpture. It was hard to imagine a cutlet appearing from the rib cage, but there is was before my eyes. Another interesting aspect was the different types of fat and how sheets of it could just be peeled away from the meat with only a little pressure. The butcher’s knife was so sharp he made the whole process seem ridiculously easy. In fact the butcher was meticulous and got lost in trimming the meat, forgetting he had an audience. It showed he took great care in the final product. I asked the butcher whether he tended to cut off more fat than he thought he should, simply because people wanted to buy lean meat and that meat with a little more fat wouldn’t sell as well. He smirked and said it was true that many people wanted leaner meat, but that he would always recommend cooking with the fat then removing the fat before serving. Another recent food trend mentioned was the sudden popularity of lamb shanks. He said previously you couldn’t give them away and now, especially during winter, they are in huge demand. Shanks tend to come from the front half of the lamb which means there’s only two per animal, making them expensive cuts to buy. Cutlets are also pricey, since each lamb yields about 16 cutlets. I learnt some new words too, such as denuding (removing the fat) and bird caging (removing the flesh between the cutlet bones). What also struck me was how nothing was wasted. The bones were set aside to be turned into rich stock that they sell frozen. Tiny pieces of meat (the size of a coin) were salvaged from between bones and fat to be used for mince or sausages. The fat was collected and would be sold (15c per 20kg) to a special company that supplies cosmetic and pet food businesses. Everything was used. It was amazing. Afterwards I bought some cutlets from the same lamb we’d cut, as well as two delicious sausages which I ate for dinner tonight (Angus beef & horseradish and pork, veal & truffles). I am yet to cook the lamb. Another day, another adventure. This is one of the most simplest and delicious dishes I have made in a long time. It's got all the elements I crave: raw fish, fresh herbs, acidic citrus and spices. You could serve it with rice, a fresh salad, spiced cous cous or even a few slices of avocado. Hmmmm. I want some more right now! Anna’s adaptation of a recipe from Julie le Clerc’s Taking Tea in the Medina. Serves 4. 2. Coat tuna then marinate in a deep, flat, ceramic dish for 2 hours in the fridge. 3. Bring to room temperature and season with salt and pepper. 4. Sear tuna 2 minutes on each side so edges are pale but centre is still rare. 5. Roll in fresh coriander and serve with lime wedges. It's a brilliant dish but it uses herbs I've covered off many times before, so no long explanation of origins, uses and etymologies I'm afraid. This week herb blogging is being hosted by Susan from The Well Seasoned Cook, so why not head over to her blog and read over the recap instead. Here’s the Good Food Month recap for Week III! Eva from Sweet Sins used the InterContinental’s High Tea sample plate as an excuse for a catch up with another food blogger. Her photo provides a perfect glimpse of what to expect. Kat from Coffee Habits ventured out for a Let’s Do Lunch at Zilver. This included their signature Peking duck and a choice between Singapore style stir fried king prawns; wok seared diced beef fillet with wasabi; red braised melting pork; braised seasonal vegetables wrapped in lotus leaf or BBQ tasting platter with barbecued pork, roast duck, soy-sauce chicken, jelly fish salad and Japanese seaweed. Kat also managed a Sugar Hit at the One on 1 Brasserie at the Radisson Hotel. Here they serve Heavenly Morsels: roasted macadamia nut and quandong crème brûlée, mixed berry crêpe stack and 5 spice pannacotta with palm glaze. Helen from Grab Your Fork was busy with two Sugar Hits in one night (in between two dinners)! First was the Sofitel Wentworth’s exquisite Lenôtre Opéra cake: chocolate pastry with layers of almond biscuit, decadent chocolate ganache with coffee butter cream and topped with gold leaf. Next was the Westin Hotel’s intriguing seasonal berries in aloe vera jelly with citrus curd and pineapple mousse. This first took my fancy when Ugenie wrote about it last week. Helen and her dining pals gave it the thumbs up so I think I’ll have to try it before October ends. Last but not least, I switched to drinking this week and tried three Cocktails of the Month: the blood orange Red October from Café Sydney, a nashi Harujuku Martini from Hemmesphere and a bungled attempt to taste the tropical Paradis Ce Soir from Industrie. Next week is the last full week of activities, as Good Food Month comes to an end. Foodie Forum: Is your greengrocer your best friend? 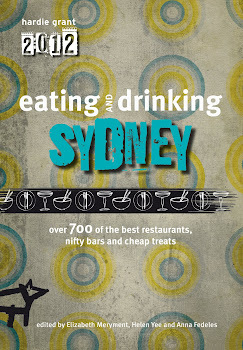 How convenient that Mixology Monday's October theme "food pairing" coincides with Sydney Good Food Month when over 90 of Sydney's bars are featuring cocktails with matching canapés (A$20). Instead of inventing my own drink and snack, I picked three interesting combinations and critiqued these. The kind people at Café Sydney accommodated my friends and I when we turned up for the Cocktail of Month at midday (it starts at 5pm). What can I say, we were eager beavers. The Red October interested me because it combined ingredients I usually enjoy (Licor 43, pineapple, strawberries) with those that I don't rate very highly (Campari, blood orange). It was described as a generous measure of Belvedere vodka shaken with Campari, Licor 43, fresh lime, blood orange, strawberries and pineapple. I couldn't taste the Licor 43 but the strawberry, pineapple and blood orange did combine to mask most of the residual bitterness of the Campari. I usually like the entry flavour of Campari but gag on the aftertaste so this cocktail delivered in that regard. Overall, it was a pleasant cocktail but not particularly spectacular. It was one of those "lounging in the sun" type drinks rather than an experience in itself. The kingfish, one of my favourite fishes when raw, was topped with shiny orange roe and micro herbs. The presence of blood orange added sweetness to the tomato salsa and the repetition of blood orange in the cocktail and canapé meant they matched each other well. The room itself was flooded with natural sunlight from the high glass ceilings. I loved the Mod black and white sofas against the burnt orange carpet and the space had a good feel despite the fact that it was tucked in the corner, away from the spectacular Harbour views. The descriptor explained that nashi pears and rosemary were shaken with Belvedere vodka and a French Poire William liqueur before getting treated to a black pepper rim. The nashi pear had a mild, slightly sweet flavour that easily absorbed the savoury characters of the rosemary, although the rosemary itself wasn't very noticeable. The cocktail was very light and easy to drink, almost non-alcoholic, so the black pepper coating (of the entire glass!) was a good addition. It brought an aromatic camphor-eucalypt scent and added a much-needed punch to enliven the cocktail. The tuna ceviche was absolutely divine. Divine! The tuna was toothsome and the tangy dressing was flavoured with lemon, lime, jalapeño and baby coriander. Fresh teardrop tomatoes, micro herbs and crispy fried onion provided textural contrasts. Although the canapé was very good, I'm not sure it matched the drink. It's not that it clashed, it just didn't compliment or enhance the drink. In fact I think the fresh, flashiness of the ceviche outshone the mild flavours of the cocktail. I had never been in Hemmesphere before and I adored the romantic revolving chandeliers and swanky Moroccanesque décor: deep lounges, plum cushions and mosaic tea lights. It would be such a comfortable place to spend an evening. When we were there (6pm on a Monday) we were the only patrons but I can guarantee the place packs out at the end of the week and over the weekend. After the first two Cocktails of the Month, Industrie’s effort was a disaster. The venue used to be a glamorous little bar with a Parisian vibe but the food stains on the banquettes and the ratty results of daily wear and tear make it seem less magnifique and more derelique. No one had briefed the staff at the downstairs bar that Industrie was even involved in the Cocktail of the Month promotion and I was treated me like an imbecile for asking about it. Once the upstairs crew explained to their downstairs colleagues, my bartender mixed my cocktail only to discover it wasn’t a full glass. When this happens I believe the bartender should discard the contents and start again since cocktails are made to measure and if you don’t get a glass full then something was missing or not measured correctly. Of course he didn’t start anew but made a second batch, which he poured on top of the first, only to discover that this came up short too. He then vigorously swirled the ice in the cocktail shaker and kept pouring the mess into my glass until I told him not to bother since all he was doing was adding water. I took my drink back to my table and where I was presented with three clumps of icy sorbet dumped onto a plate. No presentation at all and one sorbet short of the advertised four. I tasted the unnamed sorbets: raspberry, chocolate and perhaps blood orange? They certainly didn’t match the cocktail which was flavoured heavily with peach schnapps and became bitter after the sorbets. I went back to the bar and was grunted at until I discovered that I had not been served the GFM cocktail, Paradis Ce Soir (vodka, lychee liqueur, mango liqueur, lime and palm sugar), but Industrie’s Cocktail of the Week! The bartender was irritated by this point (hey buddy, how do you think I felt?). They were so incompetent there wasn’t any point bothering so I started to walk away. At the last second his customer service skills returned and he begrudgingly offered to make the right drink. It was too late. I was over it. I just shook my head and kept walking. Whatever it was, the drink I had been mistakenly served tasted nice but watery. The chocolate sorbet was good but the others were pretty pointless. The best part of the evening were the Frites Provençales, chips fried with rosemary and garlic and served with aioli. One of the girls who was with me during this fiasco had been to Industrie earlier in the week and had told me the Cocktail of the Month had been lovely. She said the sorbets had been presented nicely and had matched the drink. What the hell happened? This month the MxMo host is Natalie from the Liquid Muse so head on over to her blog to find out what other cocktails and food pairings were conjured up. It’s the two year anniversary of Weekend Herb Blogging and Kalyn must be very proud that her event has gained so much popularity. In honour of the anniversary, I decided to cook with an ingredient I had never tried before and so I marched across the street to the specialist grocer that stocks all things African. Among the cassava, cream of palm and fufu flour, I found the red liquid I was after: dendê oil. Although West African palm oil (which is almost certainly what I have) is much stronger than the Brazilian oil, I decided to cook this Brazilian seafood dish that I had seen on TV. The show had kindly shared the recipe on their website and so I set about creating a feast for my friends. Moqueca is from Bahia, a province in the north-east of Brazil, where the cuisine has been influenced by its population of Portuguese colonists, African slaves and indigenous peoples. A traditional Moqueca doesn’t need to be plain fish (peixe) but could be made with prawns (camaroa) or a combination of the two. It seems, however, that the most important element in any moqueca is the dendê oil. Many Brazilians would claim that it isn’t a true Moqueca without it. Moqueca de Peixe was always going to be a borderline dish for me, since it contained a lot of capsicum (peppers): a vegetable which I really don’t like. Surprisingly the capsicum mellowed and actually enhanced the flavour, adding sweetness. I was quite glad I’d followed the recipe and hadn’t omitted them. The dendê oil was indeed a unique flavour. It smelt overpowering (and tasted pretty strange on its own) but when it was added to the food it somehow just worked. There was a slight acridity, but overall it added richness and nuttiness and blended well with the coconut cream. This dish is really quite good and my friends went back for seconds. I would recommend it to anyone wanting something rich and vibrant on their table, where it should be served with Arroz de Haussá (rice cooked with coconut milk). The flavours are strong so I’d suggest a fruity dessert to follow. Perhaps banana? The recipe also features my favourite herb: coriander. Recipe by Maria Cristina Rodrigues da Franca Moore. Serves 4-6. 1. Rinse the fish and pat it dry. 2. Using a mortar and pestle pound and mix the garlic, malagueta chilli, 6 tablespoons of coriander leaves, salt and lime juice together. 3. Spread this mixture over the fish, then spread enough of the onions and tomatoes to cover on top. Leave for half an hour. 4. Pour the olive oil into a large saucepan and add the fish with the seasoning on top. 5. Add the remaining tomatoes, onions, capsicum, parsley, half the dendê oil and 80 mL of the coconut cream. 6. Cover the saucepan and bring to boil over a very low heat for 15 minutes, then add the remaining dendê oil and coconut cream. 7. Add some more coriander leaves and, if needed, cook for an extra 5 to 10 minutes stirring very gently from time to time. 8. When the fish is tender but firm, remove the pan from the heat and sprinkle on some freshly grated coconut and more fresh coriander. Serve with rice. Palm oil comes from an African tree (Elaeis guineensis) and has been used for centuries as a cooking oil in West Africa. The red colour of palm oil shows high levels of betacarotene, an orange photosynthetic pigment also found in carrots and a source of Vitamin A. In fact red palm oil is significantly more healthy than clear palm oil because the betacarotene and other compounds somehow have an effect. Palm oil is so high in saturated fat that it becomes semi-solid at room temperature, something I witnessed over the winter months. Once the slave trade was curtailed in the 1800s, African nations, such as the Asante Confederacy and Kingdom of Dahomey, began large scale palm oil plantations. Europeans began trading palm oil as an industrial lubricant for machinery and in 1898, B.J. Johnson of Milwaukee, Wisconsin, developed a soap made entirely out of palm and olive oils: palmolive. Did you know: Napalm is named after a recipe using naphtha and palm oil. Palm is the world’s second most produced edible oil. Most Westerners would be shocked by this, seeing as we don’t really use it. Or do we? Palm oil is believed to be in one out of every ten food items in the supermarket due to its comparatively low cost. It’s easily disguised since the red colour disappears after boiling and manufacturers sneakily label it as “vegetable oil” in the ingredients list. You’ll find palm oil in KFC, Oreos, Kit Kats, Pringles, Ritz Crackers, Sara Lee cakes and Tim Tams (Australia’s favourite cookie). And we haven’t even gotten to its use in cosmetics yet! On average, Australians consume 10kg (22lb) of palm oil per person every year. I'd imagine the US and UK would be even higher. 2) The production of palm oil has had devastating effects on the people, fauna and flora of many countries it is grown in. In the early 1900s, the first palm oil plantations were established in Malaysia and were used right up until the 60s as a method to fight poverty with employment. The industry took off with intensity in South East Asia and led to devastating environmental problems. Rainforests are cleared to make way for plantations and animals, such as Borneo’s orangutans, Sumatra’s tiger and Asian rhinos, are being forced out or killed. The cultures and livelihoods of minority tribes are also in danger. Throughout the world, 11 million hectares are devoted to palm oil plantations, particularly in the tropical areas of Asia, Africa and South America (the world’s largest producers are Malaysia, Indonesia, Nigeria, Thailand, Colombia and Papua New Guinea). These tropical areas also happen contain a large amount of the planet's biodiversity. The EU has been looking at palm oil as an environmentally friendly biofuel, and while its emissions certainly beat gasoline, diesel and LPG, the current negative effects of palm oil production cancel out its benefits. Increased demands for palm oil to feed the renewable energy industry will need to be checked against sustainable production. There are certainly eco-friendly palm oil producers, so just keep your eye out for them because you wouldn’t want to miss out on trying this unique oil and this cultural rich Brazilian dish. Head on over to Kalyn’s Kitchen for the Two Year Anniversary round-up and hear which vegetable and herb won this year’s vote. This week has seen a pick up in GFM activity. Kat from Coffee Habits spent a lazy afternoon at Quadrant, her first Let’s Do Lunch pick since they offered diners four options from beef, duck, fish or vegetarian. Kat went with the Grainfed Beef Tenderloin w Jerusalem Artichoke & Truffle Ravioli, Sautéed Spinach and Red Wine Sauce while her friend tried the Crispy Skin Duck Breast w Duck Parfait, Sautéed Witlof & Pink Lady Apples. Afterwards they indulged in a sticky chocolate and strawberry dessert that looked great. Ugenie from Itadakimasu was very diligent and got through three GFM activities in one day! First a trip to the Night Noodle Markets to indulge in rice balls, sweet potato kusabi, Dutch pancakes and fig ice cream. Next on the list was Essential Ingredient’s chocolate workshop with Lindt’s chocolatier Thomas Schnetzler where it was hands on making three types of truffles and almond crunch. Lastly the night was finished off with the Westin’s intriguing Sugar Hit of “Seasonal Berries in Aloe Vera Jelly w Citrus Curd & Pineapple Mousse”. Eva from Sweet Sins used Good Food Month as inspiration to visit the Pyrmont Grower’s Markets for the very first time (don’t worry Eva, I can’t get up that early either). Her photos capture the summer weather and colourful flowers, as well as the delicious food on sale. This week I experienced a divine Let’s Do Lunch at Glass Wine Bar where their Confit of Cornfed Chicken, Parsnip Purée, Date, Pickled Orange & Almonds had me swooning for more. I also took in some sugar at the InterContinental and tried their sample plate of high tea treats including a Cappuccino Sponge Cup, Muesli Slice and dark Praline Stick. Coming up in the next week . 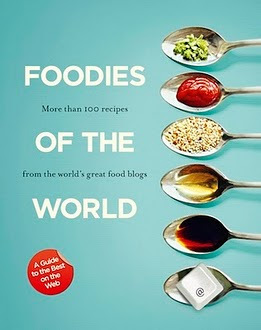 . .
For details check out the Good Food Month website. I’m looking forward to hearing what everyone gets up to next week. I’m a big fan of Glass Brassiere. I’ve eaten there a few times and each time I have walked away impressed that dishes with such rich flavour can also be so fresh and elegant. It was with this in mind that I set out for the Glass Wine Bar’s Let’s Do Lunch special. The Glass Wine Bar is an annex off the Brassiere’s main dining room, hidden behind the mountainous wine shelves beside the floor to ceiling windows overlooking George Street. Their Good Food Month special was a confit of corn fed chicken leg, parsnip puree, date, pickled orange and almonds. First, I should state that I never choose chicken at a restaurant. I cannot recall one time I have been in a restaurant and chosen the chicken dish from the menu. Not once in my entire life. Despite this, I really did like the sound of this dish. Glass had avoided the fish, lamb and Mediterranean flavours that seem to appear on half the Let’s Do Lunch list and had gone for something a little more unique. Pickled orange, dates and almonds sounded wonderful together and certainly made this main stand out from the pack. The chicken was cooked perfectly. The flesh was moist and the skin was crispy yet malleable – I devoured it with the sweet-savoury parsnip purée. The aromatic orange rind permeated the dish and almonds added gentle texture. Perhaps the date was a tad dry but it seemed more decorative than anything else and the rocket salad on the side made up for the date in nutty-freshness. The service was prompt and friendly and we were even given complimentary bread, not something generously offered when dining out on Let’s Do Lunch specials. We drank the Brown Brother’s sponsored wine, this time the 2006 Vermentino that had a slight tropical noise but a fairly acidic palate. After the meal we glanced over the dessert menu and I was tempted by the chai bavarois, the chocolate assiette and even the passionfruit soufflé, but my companions we full so I didn’t want to swim against the tide. If you’re looking for a Let’s Do Lunch in the city, this non-chicken-loving food blogger highly recommends Glass Wine Bar. Upon Natasha’s suggestion, nine sugar-craving women set off to the InterContinental to try the high tea sample plate on offer during October (Mon - Fri 10am - 5pm). Along the way we encountered evidence of Sydney's moth plague (every building was blackened with swarms of resting moths) but we persevered and made it to our destination, where I was pleased to discover that this sample plate was actually cheaper than a Sugar Hit. Dried fruit and candied rind brought a slight Christmas flavour to crumbly biscuit crescents. I was sceptical that I’d like this part of the tasting plate but it turned out to be my favourite. Dark, soft chocolate ganache sticks, infused with hazelnut, melted in the mouth. I’m not sure where the “sponge” part of the name came from since the dessert was a cup-shaped dark chocolate shell filled with rich coffee flavoured mousse. Regardless of the mislabelling, it was very good. It’s just too bad they are renovating the central courtyard and vintage elevators during the day since the noise quite disruptive. Otherwise, pleasant and efficient service coupled with good dessert and a nice cuppa. This week my theme ingredient for Weekend Herb Blogging is the mulberry. Jonas, coming from Sweden (a land of plentiful berries) had never seen mulberries before so he brought home two punnets from his recent shopping expedition. As a child mulberries meant three things to me: silkworms, berry fights and a free afternoon snack. The second I caught a whiff of their tart scent I was immediately flooded with the faint mustiness of those shoe boxes filled with silkworms. I don’t know about other cities and suburbs, but certainly when I was a kid in Sydney everyone I knew would collect cicadas and silkworms. One of the most interesting and unique aspects of mulberries is that without them we wouldn’t have silk, since their leaves are the only things silkworms eat. During silkworm season we’d fill shoe boxes with big green mulberry leaves and watch the tiny white silkworms munch their way through, growing fatter and fatter until they’d weave yellowish silk cocoons and turn into rather unremarkable looking moths. In factories, these cocoons are painstakingly unfurled by hand to become prized silk. Having tried to do it myself as a kid, I always understood why silk was more expensive than other fabrics. So with two full punnets of mulberries I had to find something to do with them. Since I now launder my own clothes there was no way I was going to have a mulberry fight: they stain your clothes terribly and I’m surprised my parents didn’t murder me every time I sheepishly came home from school splattered with purple juices. The first recipe that came to mind was from another blog and so this is a Recipe Road Test of a cake posted by Haalo from Cook (almost) Anything At Least Once – one of my all time favourite blogs and the host of WHB this week. While I made adjustments to this recipe, Haalo actually created this recipe by modifying a cake from British-Italian cook Ursula Ferrigno. So the recipe is certainly doing the rounds and retransforming itself. Making a cake today was timely because it’s Jonas' birthday. I baked the cake this afternoon and we both just sat down with a slice to celebrate. This is his favourite kind of cake: cinnamon flavour; slightly crusty edges; moist, crumbly, bread-like interior; and chunks of berries. He promptly declared it was the best cake I’ve ever made. I really enjoyed it too. It's the perfect 'coffee cake'. Recipe by Haalo from Cook (almost) Anything At Least Once. Serves 10. 1. Rinse well under cold water then remove the stems. Dry on paper towels before placing in a small bowl. 2. Sprinkle over with a spoonful of caster sugar, toss gently and set aside while you make the cake. 1. Butter and flour and line the base of a square 1x8in/20cm loose bottomed tin (you can also use a 23cm/9inch spring-form tin). 2. Place the butter, sugar, almonds, flour, egg, cinnamon and vanilla into the bowl of a start mixer. Beat until smooth and well combined - about 3 to 5 minutes. Remember to stop and brush down the bowl midway to get a thorough mix. 3. Spread half the mixture into the base of the prepared tin - flatten it with the spatula. 4. Sprinkle over with the prepared mulberries, pushing them slightly into the batter. Dot the cake with spoonfuls of the remaining batter - smooth over with a flat spatula - you want it to cover the berries. 5. Put the tin on a baking tray and cook in a preheated 180°C/350°F oven for about 1 hour until golden and springy and cooked through when tested with a skewer. Check along the way to ensure it's not browning too quickly - if it is, cover with foil. 6. Let it cool in the tin - this is a crumbly cake especially when warm so it's important that it's left in the tin under cold enough to handle. 7. Sprinkle over with a light dusting of icing sugar before unmoulding. 8. Serve with a dollop of whipped pure cream and a good cup of coffee. *Added an extra tablespoon of sugar to the mulberries to sweetened them. * Used cassia (Baker's cinnamon) instead of regular cinnamon since cassia has a stronger flavour. * Gradually added a couple of teaspoons of milk when I beat the cake mixture as it was a tad too dry and I couldn't get it to combine. * Used a fan forced oven so cooked cake for a maximum of 35-40 minutes. * Would recommend lining cake tin with baking paper to prevent sticking. Black – native to western Asia, it was brought to Europe prior to Roman times. White – native to China and the original dinner for the silkworm. They were crossed with red varieties to provide more food sources for silkworms. Interestingly, mulberries are also distantly related to breadfruit, jackfruit and figs. Mulberry trees have a growth sprint in their youth but slow down and rarely grow taller than 10-15 metres. The berries start off white or pink then the red and black varieties darken deeply when ripe. The flavours of red and black berry varieties are more flavoursome than the white berry trees. I remember when I’d pick the leaves for the silkworms I always managed to get bags and bags of the berries for myself and I’ve read that trees yield a large amount of fruit for their size when compared with other kinds of fruit trees. Black mulberries, which have the strongest flavour contain about 9% sugar and also have malic and citric acid. You can eat them fresh (although I think they need a little sugar) or you can make pies, jam and sauces. Mulberry wine is also very popular and I even have a bottle of mulberry port stashed in the cupboard. Immature fruits contain sap which is said to be mildly hallucinogenic while the ripe mulberries contain high amounts of resveratrol, a phytoalexin or antibacterial / anti-fungal chemical. Phytoalexins tend to have properties which are considers very beneficial and anti-cancer, antiviral, anti-aging, neuroprotective, anti-inflammatory. In the old days they used mulberries to treat ringworm. It’s kind of strange that the berries are very fragile and get mouldy quickly when they contain so much anti-fungal chemical. Tune into Haalo’s WHB round-up from Turin to see what other recipes have been on rotation this week. Sydney’s Good Food Month of October kicked off this week. Although the festivities have begun, Sydney food bloggers have been a little quiet and there were only three entries for the first of the weekly round ups. This may also have been due to the fact that I published the wrong email address for people to submit their links to. Sorry folks. Helen from Grab Your Fork indulged in her first Sugar Hit of the year at the InterContinental. The dessert platter included a Caramel Walnut Cognac Slice, Passionfruit & Strawberry Gelee and a Triple Chocolate Hennessey Pyramid. Check out her great photos for a peak at what to expect. Another Sugar Hit came from Lorraine from Not Quite Nigella. She tried the Sheraton on the Park's trio of Basil Scented Baked Alaska, Rosé Wine Poached Pear and Vanilla Bean Crème Brûlée. The photos of the chocolate ice cream stuffed Baked Alaska look great. There must be a tasting plate theme this year because my Let’s Do Lunch experience at Essence included a variety of savoury morsels: Baked Cauliflower Custard; Pressed Braised Pork Cheek w Apple Chutney; Dory Fillet w Confit Cherry Tomato & Aubergine Caviar and a Thai Duck Salad w Seared Scallop. I’m sure we’ll see a lot more action in Week II because most of the main attractions are starting tomorrow. Night Noodle Markets: the weekday food markets kick off and kitchen tents will be erected in Hyde Park for your dining pleasure. Shoot the Chef! : as you gobble down your dinner at the Night Noodle Markets don’t forget to peruse the professional and amateur photos and vote for your favourite to win return airfares to Hong Kong. Bush Tucker: artwork from indigenous desert communities. Hats Off: special once-off dinners at Aria, Forty One, Bentley, Billy Kwong, Bécasse and Restaurant Sojourn. SMH & Dymocks Literary Lunch: Margaret Fulton and a bevy of Sydney chefs discuss the benefits of locally sourced and organic foods. Good Living 25th Anniversary Dinner: five courses progressing through the popular cuisine of the last 25 years. Cooking: pizza, brownies, Goan fish, arancini, regional food of Emilia-Romagna (Italy), traditional Greek dishes. Appreciation: oysters, wine, beer, chocolate. I hope some bloggers will be at these events to share the experience and of course there are always the ongoing options of Let’s Do Lunch, Sugar Hit and Cocktail of the Month. If you want to include your week's fun in the GFM Week II round-up, click here to learn how.